Matrimonial sites in India are gaining popularity as an interactive platform that brings together prospective brides and grooms to establish compatibility between them. In a country like India, where marriages are solemnized in a traditional way, the search for a bride or bridegroom also takes a long time. The search for a partner is commonly carried out by parents with the assistance of relatives, friends and acquaintances. This conventional way of seeking matrimonial partner is intricate and time taking. For the same reason, now Matrimonial Sites have emerged as the modern matchmakers. 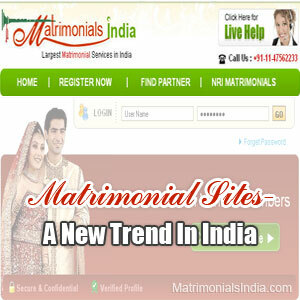 Matrimonial Sites are a new trend in India for finding a perfect match. There are a number of Matrimony Sites that carry first hand matrimonial information. These websites are a real source of information and simultaneously, offer attractive services to the information seekers. After online registration, members can post their profiles to search their match. Although the registration on Matrimonial Websites is free, you have to pay for value added services such as SMS alerts, blog-entry, chat facility, etc. There are a number of advantages associated with Matrimonial Websites. Primarily, these sites facilitate the search for a suitable match. The process is very convenient and the information exchange through Matrimonial Sites is instantaneous. Matrimony sites in India facilitate the members to come together on a common platform, interact and exchange marriage related information through selective dissemination of information. There are a number of Matrimonial Sites in India, gaining popularity in the social set-up. Some of the most famous Matrimonial sites that are getting popular are Shadi.com, Bharatmatrimony and Jeevansathi.com. Seekers are attracted by free registration. However, the paid members enjoy greater access to information. They enjoy various value added services. The popularity of a Matrimonial Site, to an extent, depends on its structural components including database. The more organized and extensive the database, the better will be the traffic on it. In this fast pace world, where Internet has become a universal source of information, Matrimonial Sites are set to rule the roost as far as matchmaking is concerned.